Take one plank of cedar 1″ x 2″ x 4′. Place it on a stair step. Lift foot. Stamp foot downwards onto cedar plank. 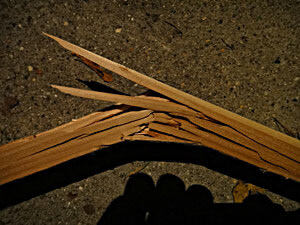 Final result may be a sweet broken piece of cedar like the one shown above. Higher res photo and other outtakes available at Flickr. Stomp too hard and you’ll break the cedar in half with one piece flying centimeters away from your nose and continuing its flight into the neighbor’s yard. That’s what I experienced a couple weeks ago.